GreenCig is registered trade name of Superdragon Group. GreenCig is modern Electronic cigarette, patent holder is Superdragon Group. UK Patent No. 2 466 758. Our GreenCig are Gold medal winner in recognition of innovative excellence in the category of health and fitness, INPEX, Pittsburgh USA 2011, and Gold medal winner of 39th International exhibition of invention of Geneva, Double Gold awards in British International Invention & Design of the year 2011 London and Gold medal in International Trade Fair of Ideas-Invention-New products Nuremberg Germany 2011. GreenCig is a unique, better-designed electronic cigarette with separate cartridge and separate atomizer for safer, more hygienic, more effective filtration. Incorporates a separate 100% sealed cartridge and a separate atomizer, unlike current single unit electronic cigarettes with cartomizers that have heavy metal elements mixing with the e-liquid. Liquid in cartridge stays pure: It will not mix with heated wires, soldering points, etc. ; won’t become contaminated by heated material, which can be dangerous to consume or inhale via vapors. Lasts longer: two to three years compared to a few months for current electronic cigarettes with unsealed cartomizers (cartridges). Extra large cartridges. Which is equivalent to 2-3 normal size cartridges, 300–400 puff from 1 capsule, 20–30 cigarette. Smoke anywhere, anytime; No ash, no fire, no butts = no waste; No tar, arsenic, formaldehyde, ammonia, acetone, hydrogen cyanide, carbon monoxide and other unnecessary carcinogens and chemicals contained in cigarettes. 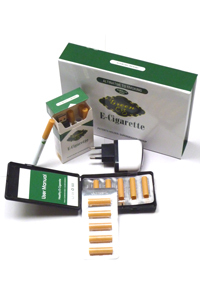 GreenCig pack contains: one battery, one atomizer; one USB charger, one EU wall USB adaptor; 13 cartridges (10 in one child-proof box; 3 in E-cigarette pack); All are in one gift box. Please make a note which flavor to choice Tobacco flavors, Nicotine high or Menthol flavor. Electronic Cigarette Patents No. GB 2 466 758 (UK Patent).